Producer Dil Raju has cast actresses Tamannaah Bhatia and Mehreen Pirzada as female leads opposite Victory Venkatesh and mega family hero Varun Tej in Anil Ravipudi's F2 aka Fun and Frustration. Actresses Tamannaah Bhatia and Mehreen Pirzada have been roped in to star opposite Victory Venkatesh and mega family hero Varun Tej, in the film F2 aka Fun and Frustration. The makers of F2 aka Fun and Frustration recently announced the movie and released its logo on the internet. Ever since, the movie has been creating ripples in the media. Besides the lead actors another factor has been adding lot of hype and that is successful and smart producer Dil Raju's association with this project. Dil Raju is producing F2 and Fun and Frustration under his banner Sri Venkateswara Creations and he is excited to introduce the rare combo of Venkatesh and Varun Tej to the Telugu film industry. Film goers have been waiting to hear about its story, heroes' roles and other details of the movie. Dil Raju has now announced some interesting details of F2 and Fun and Frustration. The producer confirmed that he has cast Tamannaah Bhatia and Mehreen Pirzada for the female lead in the movie. The film unit will started its regular in the first week of June. 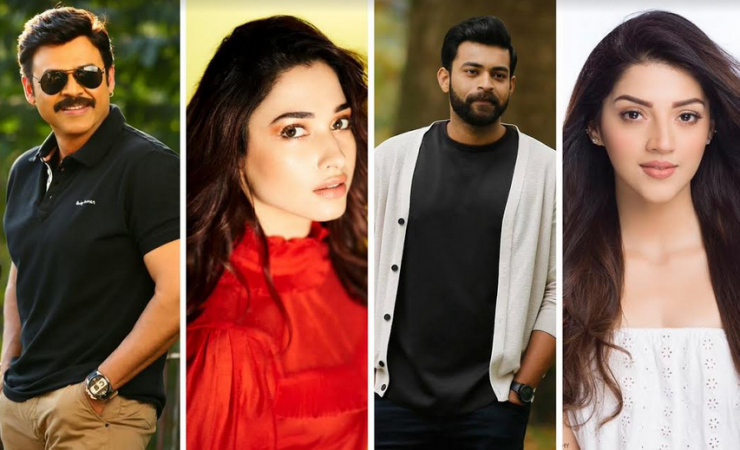 Producer Dil Raju posted on the Twitter hand of SVC, "Happy to announce that @tamannahspeaks will be paired opposite Victory Venkatesh garu and @Mehreenpirzada will be paired opposite Varun Tej garu. Muhurtam in the first week of June and regular shoot follows. #F2 #FunAndFrustration." Anil Ravipudi, who is one of the successful young directors, is teaming up with producer Dil Raju for the time after Raja the Great and Supreme. He has not only written script for F2 and Fun and Frustration, but is also directing Venkatesh and Varun Tej in the movie, which is touted to be an out-and-out commercial flick. However the makers are yet to announce the details about other technicians.